Does the job it says it does, but how many people need or want that job done? Have you ever wished that your Trash was more flexible? That it gave you more options about when it emptied? That it emptied itself? Well, if we're honest, we haven't either, but if you had, Compost would be the application for you. It's hugely comprehensive and gives you control over your Trash, which you can define independently for each volume that mounts on your Mac. It can automatically remove items after a given number of minutes, hours or days, and can limit the capacity of your Trash to a fixed size (definable in gigabytes, megabytes and, adorably, kilobytes) or as a percentage of your hard disk capacity; large files can be treated normally, 'allowed to linger' or deleted immediately. 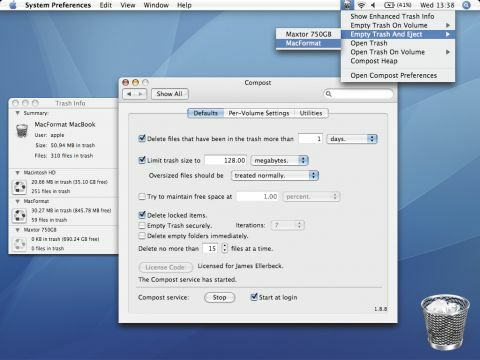 Compost will optionally try to keep a certain chunk of your hard disk free, and there are options for controlling the deletion of locked files, immediate deletion of empty folders, and how many files at a time should be deleted. You can also revive OS 9's Desktop-bound Trash can. It doesn't perfectly mimic OS X's, but practically speaking it feels the same. It can be pinned to the Desktop, floated above all other windows, or behave as a normal window. A contextual menu gives you an overview of the files in the Trashes of mounted volumes, and you can empty Trash or 'empty and eject' on specific volumes from the contextual menu or the menu bar item. And if you really need or want all these features, six quid isn't much to ask. It's just that it seems like a solution in search of a problem. What it does, it does well. We're just not sure how many people will want it to do it.